Caption: Gov. Peter Shumlin announcing the end of his drive toward single-payer last December. It took Gov. 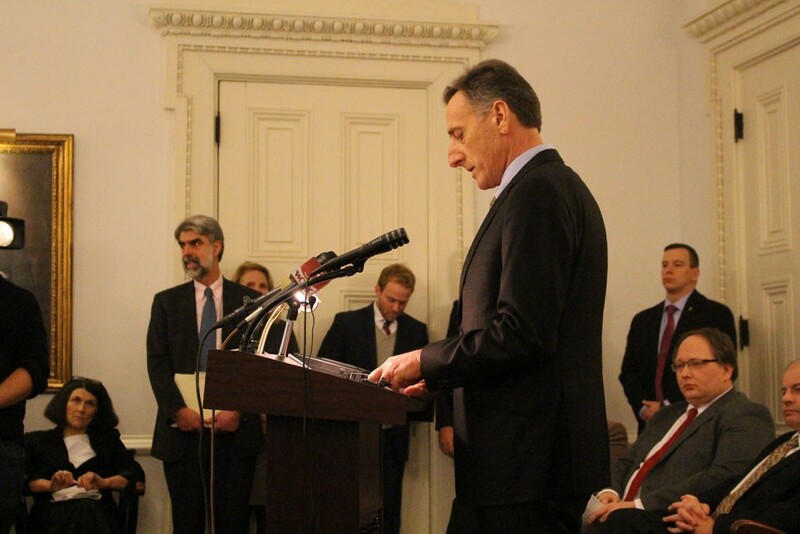 Peter Shumlin nearly four years in office to determine that his signature policy proposal — universal health insurance — was "just not affordable." But how much did it cost to reach a conclusion his conservative critics say was obvious all along? The day after Shumlin's surprise announcement last December, chief of health care reform Lawrence Miller promised to release a full tally of the costs borne during what he referred to as "this exercise." After 10 weeks — and multiple requests from Seven Days — the administration finally did so this week. According to a one-page breakdown, $697,000 of that went to 10 consulting groups, including the now-infamous Massachusetts Institute of Technology health care economist Jonathan Gruber ($160,000 so far) and Wakeley Consulting ($155,000). The other $1.33 million covered Shumlin's Office of Health Care Reform, which was simultaneously working on Vermont Health Connect, the federally mandated insurance exchange and other reforms. "It's a decent chunk of dough when you sum it all up — no question about it," Miller says. "But in the grand scheme of considering such a substantial change to such a large portion of the economy, I think it's really appropriate to spend time and effort and money on answering fundamental questions." The $2 million tally, of course, comes with a heaping pile of asterisks. First, the federal government picked up the tab for nearly $891,000 of it, leaving Vermont taxpayers on the hook for $1.14 million. Specifically, federal exchange money covered $577,000 worth of Office of Health Care Reform salaries over the course of four years, while federal Global Commitment cash covered $314,000. Second, the administration says that 10 offices, departments and agencies played a role in the process, but it declined to calculate how much their work cost the state. Last February, for example, the governor's office tasked former House majority leader Floyd Nease with selling single-payer to legislators, but neither his salary nor those of other political or communications staffers were counted. "We were really focused on direct costs," Miller says, arguing that it would be impractical to add up "a half hour here, or a half hour there." The question the administration asked itself was, "But for doing this, would these expenses have been incurred?" Miller says. "It's not trying to pretend to grab everything that could possibly be attributed," he says. Third, the tally excludes a number of enormous undertakings that might never have advanced absent Shumlin's push for single-payer. Act 48, the May 2011 law that set it in motion, also created the Green Mountain Care Board, whose job it is to regulate health care costs and explore new ways to save money. In its first four years, the board will have spent more than $21 million, much of it federal dollars. Likewise, one of the key arguments Shumlin made when he chose to develop a state-based exchange to comply with Obamacare was that it would serve as a springboard to single-payer. Nevertheless, his administration does not count Vermont Health Connect's ever-rising costs in its tally. Miller says he believes Vermont would still have built a state-based exchange in order to replace out-of-date information technology systems. And deputy director of health care reform Michael Costa, who calculated the total cost, says it's unfair to count the Green Mountain Care Board, which he notes is "still moving forward" despite Shumlin's backtrack. "Sure, it was set up at the same time, but right now all their work and all the resources required for their work is pointed to health care regulation," Costa says. Whether you think $2 million is a reasonable price to determine if single-payer is workable probably depends on whether you hoped it was. It may also depend on whether you believe Shumlin sincerely expected to sign single-payer into law — or merely dangled the prospect before liberal voters in order to win three elections. To Miller, the answer is clear. "It would be reckless in my mind to consider something of this scale without an appropriate investment in due diligence and analysis," he says. Burlington Mayor Miro Weinberger cruised to reelection during Tuesday's Town Meeting Day election, defeating a trio of rivals to win another three years in City Hall. The first-term Democrat won in a landslide. He took 68 percent of the vote, while Progressive Steve Goodkind picked up 22 percent, independent Greg Guma 7 percent and Libertarian Loyal Ploof 2 percent. Three years ago, the little-known developer and airport commissioner narrowly won the Democratic nod for mayor. Now, Weinberger has to be considered a top-tier contender for governor, Congress or any other statewide office that opens up in Vermont. Goodkind's and Guma's attacks from the left helped Weinberger position himself as a centrist Democrat — by Burlington standards, at least — and gave him the opportunity to showcase his work restoring the Queen City's tattered finances to a wider audience. To be sure, Burlington mayors don't have a great track record in statewide races. Independent Bernie Sanders won just 14 percent of the vote in his 1986 run for gov, while Prog-turned-Dem Peter Clavelle won 37 percent in his 2004 challenge to Republican incumbent Jim Douglas. And, yes, we know: Burlington isn't exactly Vermont. But when you consider the numbers, Weinberger's near-universal name recognition in Burlington — and throughout Chittenden County — would be a major asset in a crowded Democratic primary. Back in 2010, in the last competitive gubernatorial primary, more than 7 percent of those casting Democratic ballots hailed from Burlington, while more than 27 percent came from the county. Sure beats the 1.4 percent that voted in House Speaker Shap Smith's (D-Morristown) district. Among Statehouse busybodies and idle columnists, the question of whether Shumlin runs for a fourth term in 2016 is often answered thusly: After narrowly clinging to the job last fall, he'll seek to redeem himself in two years' time. But a better question for Vermont Democrats may be whether the incumbent is really their best candidate. A new Castleton Polling Institute survey commissioned by VTDigger.org finds that, for the first time in his governorship, Shumlin's approval ratings are underwater: Only 41 percent think he's doing a good job, while 47 percent don't. Those numbers shouldn't shock, given that the dude won just 46 percent of the vote last November, but it's hard to see how he'll turn them around anytime soon. The centerpiece of his legislative agenda — imposing a new payroll tax to remedy a cost-shift problem that few Vermonters understand — ain't exactly a barn burner. And whatever budget he signs into law in May will surely alienate a sizable chunk of the electorate. Shumlin's problems aren't just with fickle independents, 37 percent of whom approve of his job performance and 50 percent of whom don't. It's with Democrats, too: Only 62 percent of them think he's doing a good job, while 27 percent don't. Sure, the election's 20 months away — a lifetime in Vermont politics — but fellow Democrats pondering a run of their own will expect a go/no-go decision by fall. Last October, more than a dozen House Democrats gathered at the Statehouse to hold an unusual preelection press conference. "We're hearing loud and clear on the campaign trail our neighbors' frustration with increasing property taxes," said Rep. Sarah Copeland Hanzas (D-Bradford), who organized the event. The Democrats offered no specific plan — and they dodged reporters' attempts to pin them down — but they pledged to fight for tax relief in the coming legislative session. And they said they'd work together to restructure the state's education finance system so that it levies taxes based on income rather than property values. But by the time the House Education Committee unanimously approved its much-discussed ed reform bill last Thursday, the debate over moving to an income-based system was, for all intents and purposes, over. While plenty have offered conceptual plans to accomplish that, committee chairman Dave Sharpe (D-Bristol) says, "Until someone is willing to put some numbers on the table that we can consider, I'm reluctant to move forward with it." Copeland Hanzas, who was elected majority leader last December, now says she always knew it would be tough to accomplish that goal. "But, honestly, most important is figuring out how to stem the rate of [spending] growth, because it doesn't matter which pocket you take it out of," she says. "If it's growing faster than it should be, we need to change that first." How much — and quickly — the committee's bill would slow spending is unclear. Very preliminary estimates offered up by the Joint Fiscal Office last week pegged savings at $25 to $50 million, but not for several more years. It will take time for the bill's central reform — consolidating school districts so that each has at least 1,100 students — to bear fruit. In the meantime, the committee proposed prohibiting school districts from increasing per-pupil spending by more than 2 percent a year — a provision that has angered the state's teachers union and will likely perturb those who favor local control. Sharpe concedes that the spending cap "needs more work" and expects the House Ways and Means Committee, where the bill heads next, to adjust it. But he believes it's fundamentally a good idea. "We felt pretty strongly that it needed to have some immediate downward pressure on budgets, since the expanded school districts' vision won't be fully realized for three or four years," Sharpe says. It's unclear whether the caps were added so that lawmakers had something concrete to take home to Town Meeting Day during their weeklong recess, but it is clear that the idea will face strong opposition when they return. "Spending caps are a ludicrous solution to any issue surrounding education," says Vermont-National Education Association spokesman Darren Allen. "We're especially disheartened that a Democratic governor and a Democratic legislature would consider such an obviously inappropriate tool." After months of retrenchment, the Burlington Free Press is rebuilding — a bit. The paper has hired Paris Achen to cover government and politics; she started this week and will join April Burbank on the Statehouse beat when the legislature returns. A University of Oklahoma grad, Achen spent close to four years at the Columbian, a daily newspaper in Vancouver, Wash., where she most recently covered courts. Since last summer, eight of the Free Press' 28 editorial staffers have retired, departed voluntarily or been laid off. It appears just two positions have been filled, including Achen's. Neither Free Press executive editor Mike Townsend nor associate editor Adam Silverman replied to requests for comment. In other media news, VPR producer and host Peter Biello is crossing the river to anchor New Hampshire Public Radio's edition of "All Things Considered." Biello made a name for himself off-air leading — and dramatically expanding — the Burlington Writers Workshop. The original print version of this article was headlined "$2 Million Baby"